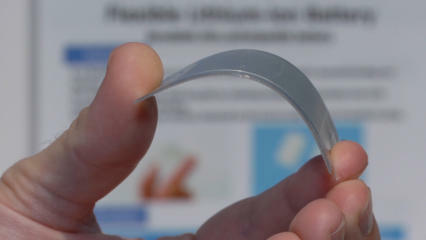 Batteries that can easily conform to the human body could be a game changer for wearables and flexible electronics. At just 0.45mm thick, Panasonic's latest lithium-ion battery design is small enough to be unobtrusive and bendy enough to be comfortable. According to Panasonic, the battery has a laminated outer body and internal structure. This prevents leakage and abnormal heating during bending and twisting. The batteries are still under development. There's no word from Panasonic on when they might enter production.